Morocco shipped 1.93 million tonnes of phosphate out of occupied Western Sahara in 2018, worth an estimated $164 million, new report shows. Here is all you need to know about the volume, values, vessels and clients. Above: Morocco is increasingly depending on a few clients for the Western Sahara exports, report shows. 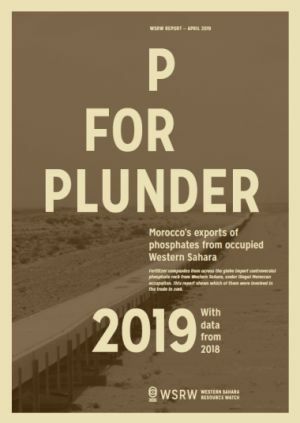 Western Sahara Resource Watch (WSRW) has today launched the sixth edition of its annual P for Plunder report, an overview report documenting the trade of phosphate rock from Western Sahara during the previous calendar year. at $163.88 million, shipped in 33 bulk vessels. An increase in exports since 2017, the report shows. The imports of Morocco’s production in Western Sahara in 2018 are attributed to six companies from four countries internationally, while approximately 72 companies worldwide have been identified as owning or operating the vessels that have transported the phosphate rock to the importers. Download the report here (web version, 3 Mb). While the total exported volume is rather high, it is of note that the main importer, Nutrien Ltd from Canada - single-handedly responsible for nearly 50% of the year's shipments - decided to halt all further imports from the territory from the end of the year onward. As such, Morocco's exports of the Saharawi conflict mineral to North America have been terminated. But 2018 also saw two new clients emerge: Coromandel Ltd in India, responsible for a single, small shipment, and Sinofert Holdings Ltd in China, which interestingly has Nutrien as its second biggest owner. While no Western Saharan phosphate has been exported to Europe over the last two years, there are still European companies involved in the transport of the contentious commodity. The most heavily involved operator is Ultrabulk A/S from Denmark, having carried out 6 of the 33 shipments in 2018. A sizeable number of the vessels used for shipping the phosphate rock are owned by Greek companies. WSRW had observed that ever since vessels transporting Western Saharan phosphate were detained in Panama and Cape Town in 2017, not a single shipment has gone via Cape of Good Hope or through the Panama Canal. That trend continued throughout 2018. Similar P for Plunder reports were also published in 2014, 2015, 2016, 2017 and 2018. WSRW calls on all companies involved in the trade to immediately halt all purchases of Western Sahara phosphates until a solution to the conflict has been found and the Saharawi people have been assured the exercise of their fundamental right to self-determination. Investors are requested to engage or divest unless companies commit clearly to withdrawing from the trade. The report can also be downloaded in print version, 18 Mb.